Only the right mixture of passion and artistic ability can create portraits that truly move the soul. 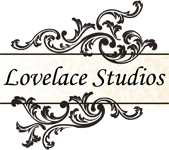 At Lovelace Studios, you will feel comfortable and confident throughout the entire process. Denise and Michael started the studio based on Denise’s passion for art and innate talent for seeing the beauty in everyone. She began her journey as a respected and published hair stylist where she was able to help her clients see the same beauty she saw. As she progressed, she realized that capturing that beauty on film was the next logical step. A mother of three small children herself, Denise quickly established herself as a premiere photographer of babies and children. Her warm and easy demeanor seems to set her clients at ease as she draws them into the images. The Lovelace’s understand just how quickly children change and have studied and mastered the art of capturing that instant in time that is then lost forever. Whether it’s the newborn that is barely larger than your hand or the snaggle-toothed smile of innocence on your young child’s face, these are the images you want to remember for a lifetime. Let Denise and Michael help you slow down time, even if only for a moment, so that you have a memory forever, a beautiful reminder of the most important things in life: family, togetherness, and love. . .